Serbian President Aleksandar Vucic speaks during a press conference in Belgrade, Dec. 3, 2018. 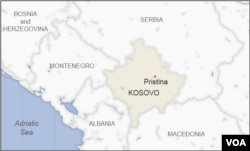 Serbia sought support from allies Russia and China on Tuesday in opposing the formation of a Kosovo army, warning that a military in its former province could lead to renewed clashes in the Balkans. Serbian President Aleksandar Vucic met separately with the Russian, Chinese and U.S. ambassadors in Belgrade on Tuesday, saying that “continuous provocations” from Kosovo could leave Serbia with no choice but to “protect” the Serb minority. “The irresponsible behavior of Pristina could lead into a catastrophe because Serbia cannot peacefully watch the destruction of the Serbian people,” Vucic said in a statement. Vucic said it's “completely clear” that both the formation of the army and the tariffs are intended to “force Serbs out” of Kosovo.